This artist's concept shows the newfound alien planet Alpha Centauri Bb, found in a three-star system just 4.3 light-years from Earth. The instrument astronomers used to discover the small rocky planet circling the star Alpha Centauri B that was announced this week was not a glitzy new high-tech space telescope, but rather a decade-old workhorse attached to a ground observatory in Chile. 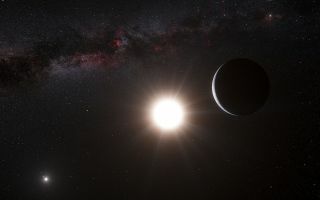 HARPS, as the instrument is called, successfully detected a rocky planet around one of Earth’s closest neighboring stars when other tools missed it because astronomers have had plenty of time to learn what it is capable of, planet hunter Xavier Dumusque of Geneva Observatory, Switzerland and the Center for Astrophysics at the University of Porto, Portugal, said. After 10 years of working with HARPS, "we understand much better how the instrument works now," he added. Alpha Centauri Bb, as the new planet is known, has a mass about the same as Earth and is likely rocky. However, unlike Earth, it's likely roasting at 2,200 degrees F (1,204 degrees C) due to how close it is to its parent star. HARPS, a spectrograph on the European Southern Observatory’s 3.6 meter telescope in La Silla, Chile, works by looking for telltale "wobbles" in a star, caused by an orbiting planet gravitationally tugging on the star. That means that it's much easier to find heavy, Jupiter-like planets than tiny low-mass planets. "This technique depends on two things," Dumusque said. "The mass of the planet — the more mass, the easier it is to detect — and also the distance to the star. In this case, it is a small-mass planet, but it is still very close," which is what made the detection possible. The HARPS spectrograph during laboratory tests. The vacuum tank is open so that some of the high-precision components inside can be seen. Image released March 27, 2003. That led to the discovery of the planet, which is "for sure" accompanied by others that scientists haven't yet found, he added. "Statistics show that if you have a very small mass planet in one system, you have other planets in the same system. With this case, with Alpha Centauri B ... we don't have the precision to find them, but for sure there are other planets in the system." Alpha Cen Bb's gravitational effect on the star causes it to move by just 19.6 inches (50 centimeters) per second. In comparison, if alien observers wanted to discover Earth using the same method, they'd need an instrument that could detect wobbles of 3.9 inches (10 cm) per second. The Espresso instrument, scheduled to go online in 2016, will be able to observe with that precision. "With this instrument, it should be possible to discover Earth's twin," Dumusque said.